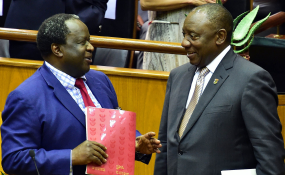 The bail-out bonanza for state-owned entities (SOEs) is coming to an end, according to Finance Minister Tito Mboweni speaking to media ahead of his maiden Budget speech on Wednesday. If there were any monies to be allocated, government will also ensure there would be a chief reconfiguration officer to keep watch on taxpayers' money and other conditions. Eskom is a case in point. After months of speculation, Eskom received R23-billion this year form the national coffers and the same injection for the next two years until 2022, totalling R69-billion, to support its restructuring. There are still no clear time frames for this unbundling into three divisions for generation, transmission and distribution, but it's getting under way. There's set to be further announcements on a restructured electricity market, according to the Budget Review, that also talks of a possible strategic equity partner for the future transmissions entity.